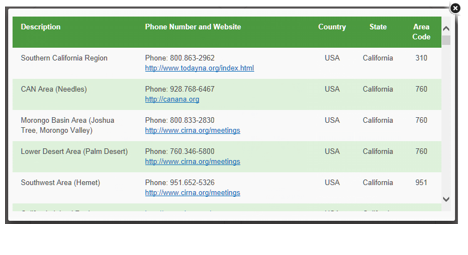 Use this method to locate helplines and websites for local groups near you who can assist you in finding a meeting. This is our best recommendation for finding an NA meeting. Use this method to locate meetings near you. Caution: Meeting schedules periodically change, this data may not be up-to-date. The NA Meeting Search app version 2.0 is now available for your smartphone or tablet. The information here is the most current we have on file. If the information you find on our website is inaccurate, please notify us, or your area or region so that the information for the meeting or group can be corrected. On the search result pages, we provide links to maps of local meetings as a service for anyone trying to find their way to our meetings. Such links do not constitute any endorsement, affiliation or approval of the service or company providing the maps, nor any pages linked from those map pages. NA World Services does not register online groups, but we list online meetings as a service. This listing does not mean that online meetings are considered NA groups or a part of the NA Service Structure.